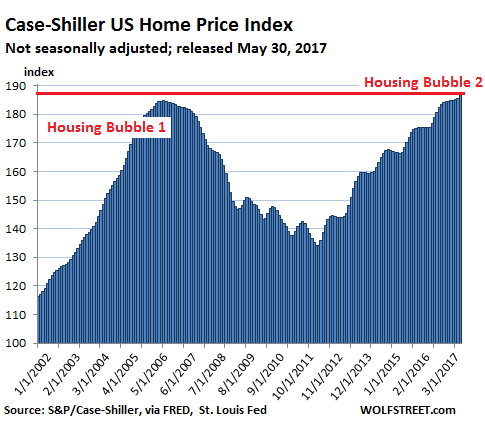 Here are some visual aids to help the Fed spot the housing bubble. But it’s OK to use these “limited policy tools” to inflate the greatest bubbles the world has ever seen and then preside over the damage they cause to the real economy before they even implode. Neither Kashkari nor anyone else working at the Treasury Department in 2006 – when they were tasked by Secretary of the Treasury Hank Paulson to look for signs of trouble because they were “due for some form of crisis,” as he writes – could see any bubbles, not even the housing bubble although it was already beginning to deflate. So here are some visual aids I put together for Kashkari and other Fed governors. 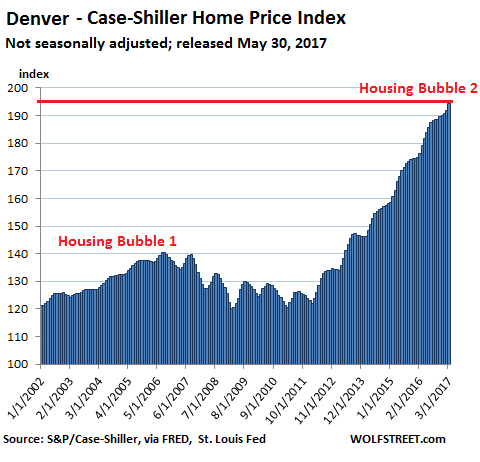 It will help them “spot” the beautiful housing bubbles in the US – because bubbles really aren’t hard to recognize before they burst, if you want to recognize them. What’s hard to predict accurately is when they’ll burst. The S&P CoreLogic Case-Shiller National Home Price Index for March was released today. It jumped 7.7% year-over-year, far outpacing growth in household incomes. This has been the case for years. In fact, real household incomes are almost back where they were in 2006 (/sarc). So what could go wrong? 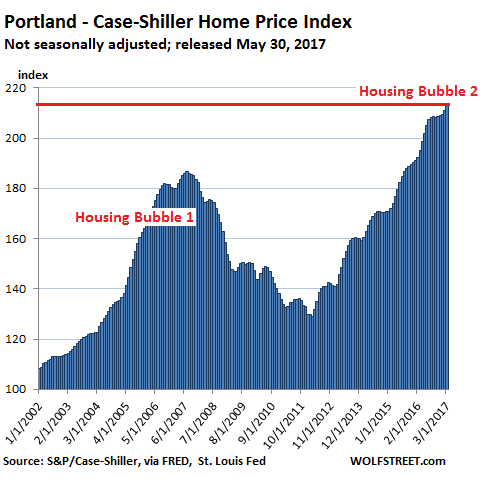 Since everyone called it a housing bubble after it had imploded, even Kashkari, today’s phase in the wondrous market is Housing Bubble 2, no? The other day, Zillow reported that the national median home value in April rose 7.3% year-over-year to $198,000. 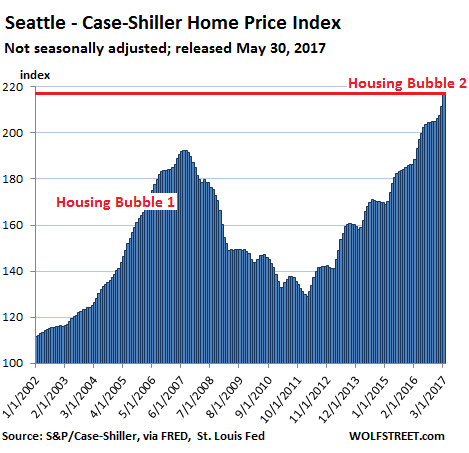 It too beat the peak of Housing Bubble 1 ($196,600) set in April 2007. “It only took a decade,” Zillow said. The National Association of Realtors reported that the median price in April hit $246,100, which is 6.8% above the peak of Housing Bubble 1 ($230,400 in June 2006). The Case-Shiller Index appears to have more stature at the Fed than Zillow or the NAR. So we’ll use it here in our visual aids for the Fed. It is based on a rolling-three month average; hence, today’s release was for January, February, and March data. So it’s always behind. Instead of median prices, it uses “home price sales pairs,” for example, a house sold in 2011 and then again in 2017. Its algorithms adjust this price movement over the years and numerous other factors into a data point that becomes part of the index. The index was set at 100 for January 2000. So an index of 200 means prices have doubled in the past 17 years. Housing is local. Therefore housing bubbles are local. But if enough of them come together at the same time, the housing bubble takes on national proportions. This is the phase, as the above chart shows, that the US has now reached: In some metros, prices are still below the peak; in other metros, prices are setting new records. Overall, prices have surpassed those of Housing Bubble 1. I know that folks in the Dallas-Fort Worth metro felt left out during Housing Bubble 1. I heard many complaints about that at the time. They also missed out on much of the house price crash. The city of San Francisco is also the first city in this lineup where the median home price is now heading south on a year-over-year basis. During Housing Bust 1, the City was late to react. This time, it seems to be ahead of the pack. The local housing bubbles across the US blew up with spectacular consequences, all in their own time frames. Plenty of local home price bubbles are now coming together to form a national home price bubble. So it’s really not hard to spot them, Mr. Kashkari. Sure, there has been some inflation – 17% since 2006, based on the Fed’s favorite core PCE measure. Home prices in some of the cities have already reached a new peak even after inflation. 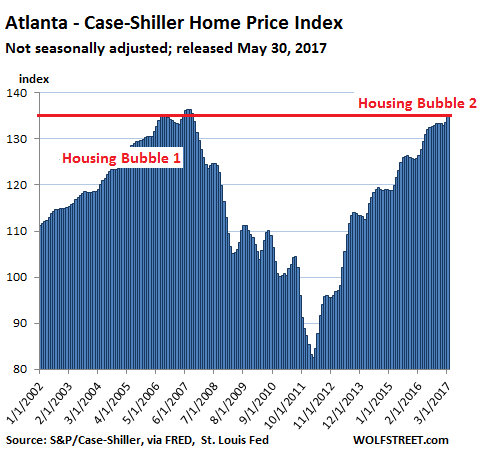 And besides, it’s not a housing bubble until it reaches the inflation-adjusted point where the prior one took down the financial system? Is that the point when Housing Bubble 2 begins, instead of ends? If so, what would Housing Bust 2 look like? A vision too ugly to behold. 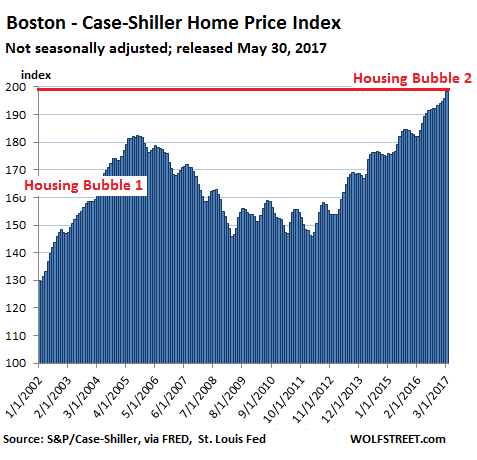 What’s hard to predict is the moment when housing bubbles begin to deflate. With monetary policies still in easing mode, with the federal government subsidizing the housing market in numerous ways, and with homes having become a securitized asset class for global speculators, house price bubbles can inflate – as we have seen – far more than a rational human mind might think possible. But we do know that they will deflate. In San Francisco, the signs and numbers are already lining up. 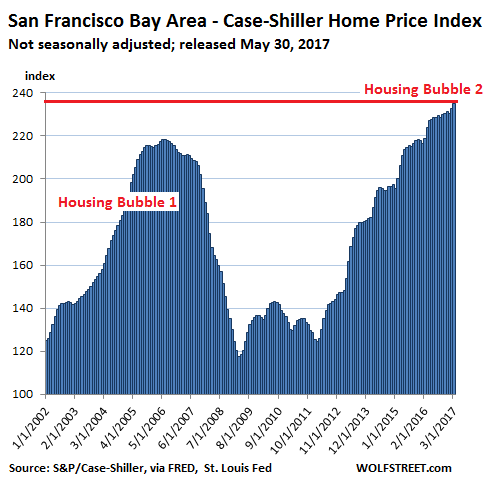 Read… Will these 2 Forces Crush San Francisco’s Housing Bubble? 1. deny low risk return, thereby forcing pension funds and retirees etc into riskier assets, which are being front run by more sophisticated traders. 2. debase stored value of labor while denying risk free return. Close. But complaining is good education but fruitless. A congressional act to audit the Fed and another to manage how interest rates are changed is required. The central banks are controlled entities. Each follows their own national agenda. The Eurozone would end if ECB QE ended. China needs printed money to maintain social stability after a hillbilly spending rampage created almost unmeasurable debt levels. Japan’s reasons are inscrutable. The Fed started QE as a means to support the globalists. The upper 1% became wealthier beyond comprehension as a result. Bubbles are a necessary byproduct to keep the plate spinning here. Hence, bubbles are not ‘bubbles’ in the classical definition … they are the means to an end. Incidentally, the more I think about it, the more convinced I become that the ‘Great Recession’ was just a contrived shortage of working capital available for lending. The falling stock market was used for cover and as a distraction. QE was birthed here under this ruse. The rest is history. Nah. Reform via government will NEVER happen prior to a crash even worse than 2008, -IF- even then. On matters relating to significant changes to the status quo flow of large sums of taxpayer money and new debt accrued on the citizens’ tab, your government DOES NOT represent YOUR interests. PERIOD. WHEN are people finally going to realize that? Why don’t they represent YOU? Because the current system benefits those who actually own our governments – corporate campaign donors tied to lobbying and donations from the 0.01% – and the politicians who, via debt, never have to admit they can’t pay for their promises with tax receipts. A grass roots method to crash the system completely thereby FORCING a change which any individual can do -> save, don’t consume, and when you do consume, do so without incurring debt whenever possible; if you must incur debt, pay it off as soon as possible. That’s what I do. Stop griping and join me. That is accomplished through what is called the ability for “delayed gratification”, something the modern treadmill gerbils don’t know thanks to the PARASITIC financialization of everything since the early 1980s. It would be interesting if someone would estimate what percent of people would need to take that simple measure to bring the skimming system to its knees and the economy with it, thereby FINALLY triggering mass outrage among the herd. Nice idea but they have a cure for that … negative interest rates. Think what you want and say what you want, but they still get the money and you lose yours. Sticks and stones may break their bones but they make the rules most of the time … just not today thanks to Trump. Agree changing the law is a long shot but it’s all we have right now. In my opinion, what popped the 2008 bubble was the concentration of money in one generation. As soon as Boomers realized they were over-leveraged and stopped spending, new debt stopped being created and all generations lost their debt-driven incomes. At least in 2008, people had real jobs. In this bubble, we just have the 1% buying equities and properties. Many Boomers lost their retirement funds and investments in 2008. Do you think the decaying middle class will vote to give the affluent more cash after this bubble pops? That is why this will be the last bubble, and of course, no egocentric, megalomaniacal CBer could determine that they created another bubble. If the Fed wanted to create the vision that commercial banks can only make money by trading in financial markets, and the price-to-earnings multiples are ridiculously inflated, and that a bubble can’t truly be observed before it pops, they have succeeded beyond their wildest intentions. What popped in 08 was the NINJA flipper market as it ran out of steam in was agenuin ebubble they go up then burst not cruise at the top and gentle deflation. It then took much of the fraudulent financial excess that that had perpetuated since the repeal of Glass Steagal with it. 1987 in Asia was mitigated by printing, which brought the 1997 AFC. Which brought the 2000 US event, which brought 2008 as each time instead of absorbing the losses, the losses were cover by more borrowing including past interest due. No bank wants to absorb the defaults as they were forced to in Europe, during the exposure of the greek fraud’s. china most defiantly dosent want to see any slow down due to the closure of so many State owned Zombie Entities. So denies the issue exists. This situation will continue no matter what the FED does, until the chinese or Europeans ,are hit with an event they can not control. If it happens in china first, watch our for war, as the CCP just like DPRK is an “If we cant have it all. You cant have any either ” Mentality state. NIRP will only work if they ban cash and precious metals. IF they ever try that in the US, we will no longer need to wait for “real change.” There’ll be plenty of it, enforced from the bottom up. Oh, please. The deep state swamp is walking all over him, enabled by the majority RINOs who are bought by very much the same interests as the Dems. The Reps are the PHONY opposition who gain votes by acting like lions when they’re not in power and like timid lap dogs when in power. While a “democratized” central bank sounds attractive, the masses and the politicians will always opt for lower lending rates over higher rates. Don’t be fooled by online conversations with fellow central bank critics. Most people out there – including political leaders – don’t see things your way at all. Since borrowers and spendthrifts will always outnumber those of us who are critical of easy money policies, democratization of central banking means more easy money policies, and disaster. If anything, we need a return to some sort of iron-clad gold standard, which would remove entirely the ability of central banks to print our way out of trouble. But I’m not sure a gold standard could even work in a modern setting. I don’t quite understand the intricacies of monetary policy enough to say for sure. I am not defending the job independent central banks are doing. I think they are screwing things up frightfully. But I remember a time when honourable men. men with backbones (i.e. Paul Volcker in the US, and Gerald Buoy and then John Crow in Canada) ran central banks, and considered monetary stability (i.e. price stability) to be the overriding objective. And they accomplished this objective with a steely resolve in the face of massive public opposition. We need independent central banks, and we need them run by that kind of person. Will politicians ever appoint such people to the helm again? That is the big question. It is in the country that they do so, but hardly in the interests of their own prospects for re-election. At this point,telling any Central Banker that their policies cause problems is almost the same as thinking Ken Lay and Jeff Skilling were blindsided by Enron’s problems. Let me make it real simple for those Fed geniuses: we’ve now had NEGATIVE real short-term rates for over eight years. That means that for EIGHT YEARS human beings have been PAID to borrow money. Now I ask you, Fed professors: what do human beings do with ANY resource when they’re PAID to use it? It’s not rocket science, boys: they f’ing SQUANDER it in really stupid f’ing ways. Here’s a thought experiment: what do you think would happen if water meters ran backwards? Answer: every lawn in America would look like the 18th green at Augusta National. Now would that be a wise way to use water? So here’s the conclusion: any time you pay people (in real terms) to borrow money, you AUTOMATICALLY create bubbles. Forget the search for “additional evidence” (at which you Fed folks are consistent abject failures). Just don’t ever, ever, ever PAY people to borrow money. Got it??? Excellent work, Wolf! Thank you very much for your insightful pieces. I guess there’s one obvious question, if real household income’s haven’t moved past 2006, who’s buying all of these homes? Are folks getting loans that they don’t qualify for and are now up to their necks in debt or are “investors” running up the price? Or both? Of course, because at that point the costs can be dumped on the public. What’s taboo for the Fed is doing anything that might impinge on bank profits, regardless of recklessness or the ultimate damage they cause. I read the S&P Index statement today in a local article* and wondered if you’d review it. Can you say “gig economy”. Wall Street loves these ultra cheap worker bee’s. Parts of NYC are already a buyers market. http://media.halstead.com/pdf/Halstead-Absorption-Report-may-2017.pdf A balanced market is 6 to 9 months to absorb the inventory. 20 months is a buyers market. 5 months a seller’s market etc. The super high end condos in NYC are now experiencing foreclosures. Crack! It was financed rather interestingly: LLC shielded buyer purchased in 2015 for $21.4 million. There is a lien on the property in the amount of $20.9 million plus “interest and costs.” Less than 2% down??? Nothing fishy going on there. Dear Fed, instead of looking for bubbles, look for thieves and liars, the world’s greatest. You would simply need to look in the mirror Janet, Niel, Ben, Alan, and the rest of your kind. You left out Super Mario or is he “all the others”? The Fed has “legal/political cover” for certain activities, e.g. raising and lowering interest rates, QE, etc. (although some parts of QE may in fact be illegal, although I am not a lawyer- as in what they are buying). So, they don’t need to or get rewarded for recognizing or communicating about bubbles. They can raise rates (and do some other things, that would be smarter, e.g. reserve requirements, etc. ), to accomplish things like “policy normalization”, “meeting inflation targets”. They know they will cause a recession, e.g. look at Volker’s Fed (they knew quite well that they were purposely causing recessions. “Follow the money”- they don’t get rewarded for recognizing or calling bubbles- so they may never do it. They have to have “dull”, slightly complex (misleading?) communications. That’s part of their toolbox. All of you searching for the sources of increasing income inequality, look no further than the Fed’s policies. 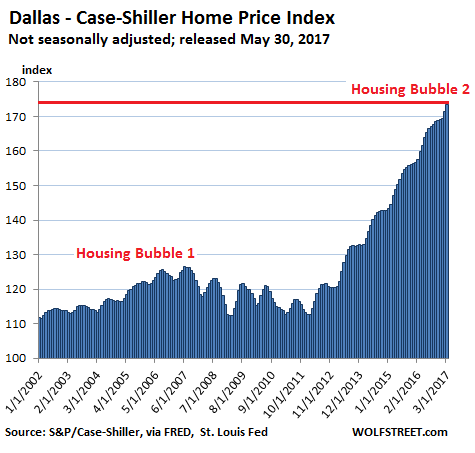 Regarding the big home price increase in DFW – it’s real and it’s really crazy. We are told that it is a result of the influx of Those leaving California. The price difference between sky high Cali homes and much lower priced (even after the huge jump) DFW homes cause the transplanted new Texans pay stupid money for a home because it is a steal compared to what they left. If the Fed admitted there was a bubble, it would pop, so they don’t. It would be like telling your wife she’s gaining weight. Best to let her live in the bubble until her productivity turns negative. That is a brilliant analogy Bobber. the problem with printing trillions is that you never know where they will show up in the economy in advance. Now we know it. There’s a wave, and they always knew it. Elihu Root warned: if you create the Fed, you will be creating an engine of inflation (1913 debates). Bonds, stocks, real estate, collectibles and art. Reverse, then start over. Since the Fed started. 1919-20 was the first bubble, crash. Why are people surprised? When a group creates a private entity and calls it “Federal Reserve”, the intention of the group is obvious right from the get-go. If I ask someone for an Id, and he gives me a fake Id, I shouldn’t be surprised if he rubs my store. The so called Feds, know exactly what they are doing; it’s like a play from a playbook, and they keep playing it over and over till we are all on a leash. It’s bankers running the show for themselves. The Fed is a legitimate arm of government [it needs a banker] but stacking the board with bankers from outside, just gives these foxes keys to us in the henhouse. They have been getting away with it for 300+ years, so don’t expect change any time soon. You need to brush up on your history. All your facts are wrong. By the way Wolf, great article; extremely informative with amazingly clear charts. – But the amount of new home construction has been low to very low in the timeframe say 2009 – 2017 in comparison to the timeframe say 1970 – 2005. That could be a (good) reason why real estate prices have risen again. – And DO NOT underestimate the psychology of “rising (real estate) prices”. (Did I mention the word “FED” in the text above ?? Rates are determined by a entity called “Mr. Market” and not by the FED. Although the FED has put its finger “on the scales” by performing QE in the past). The Fed bought $1.8 trillion (with a T) in mortgage-backed securities specifically to bring down mortgage rates. It is still buying mortgage backed securities to replace the ones that are maturing. The Fed also bought Treasuries, including 10-year Treasuries, and it continues to buy them to replace the ones that are maturing. This was also designed to bring down mortgage rates. The Fed also specifically encouraged Wall Street (PE firms) to buy up foreclosed homes by the hundreds of thousands and rent them out and made low-cost funding available to them to do so. This happened in late 2011. I linked this document from the Fed a while ago. The Fed did everything it could to drive up home prices. It was part of the plan laid out by Bernanke. And it worked. Open your eyes to the Fed and get informed about it. To continue … the low rates managed by Federal Reserve policy caused interest income earned by savers to fall significantly. People could no longer earn enough interest to live on, supplemented by social security, even with a $1 million balance. Perhaps if they timed their purchase of 30 year debt correctly it would be possible, but this is a thin exception. Living on interest earned on short term debt would be impossible. Bernanke stated publicly that equities were a good place to go instead of debt and also spoke publicly about the Fed’s efforts to raise the value of stock prices to accomplish this end. Hence, the bubble the Fed is now trying to protect. Low rates eviscerated savers initially. Falling stock prices would do it again. Ignored was the obvious and basic idea that your interest expense is my interest income. People who earn interest income spend it. Spending expands economies and creates jobs. Interest rates of normal historical levels cause borrowing to be used for investment that creates jobs. Artificially low rates support paper flippers who create a low number of high paying jobs in the paper flipping industries. Low rates eliminate interest income opportunities for savers. Why borrow to expand your business if there are fewer people who can afford to patronize it? Bernanke and various other past and present Fed members often rationalized this as the benefits being greater than the costs. Analyzing this statement while observing the obvious clearly shows a financial community that is more interested in supporting those with power and wealth than the majority of the people who live here. Their massive wealth was supposed to trickle down to the rest of us, unless we were willing to get into equity markets that were artificially elevated or buy long term bonds when they took large dips in price. Had Trump not won, negative interest rates in the US were the next logical step in Fed policy. Negative rates support borrowers while serving as a tax on savers. These are not good, decent people and are only being made to act as such because they see problems ahead if they don’t change. They will and would backslide in a heartbeat if they see the opportunity and spin bizarre theories with straight faces to support them. – Nice piece of info I wasn’t aware of. I wasn’t aware that the FED had been encouraging “Wall Street”. – But it was made possible by rising prices. Rising prices are crucial to create inflation (= increase of money and/or credit). Without those rising prices the entire scheme would have fallen flat on his face. I dug it up just for you :-) Here’s one of my articles on Wall Street getting into housing. This one focuses on eviction rates. It includes a passage of the Fed document where Bernanke encouraged PE firms to get into this. It also includes the link to the Fed document (“Housing Market in Transition). – Didn’t it was this bad (again) regarding the home prices. Ouch. correction: – Didn’t know it was this bad (again) when it comes to home prices. Ouch & OMG. I hope I am wrong, but I think the government will try to blow the Mother of All Bubbles and keep this thing going until we become European. In France, Hungary and Netherlands, its not unusual to buy ‘investment properties’ that will earn less in gross income than the purchaser’s costs per month. Its also not unusual for a mid-30s high wage earning couple to buy a property on an interest only loan. Europe’s low interest rate environment has normalized this type of behavior. In the wonderful USA, in many places one can buy a property, rent it out and with a little luck still cover his or her costs. Will the factors of looser lending standards and the recent changes to FICO scores, plus a continued influx of foreign money lead to this bubble growing even bigger? P.S. Wolf, your content is the best. I have been looking at French property since late last year after keeping a weather eye on it for a couple years and the market is full of very nice properties in excellent conditions at what I can only call reasonable prices. I am told this property was bought by foreigners and city dwellers either as an “investment” or as a vacation house using extra-low interest rates mortgages but soon the new owners discovered how expensive is it to maintain a second/rental house. I have no reason to doubt it: junk fees on second houses alone will eat you alive throughout most of Europe. You’d say your garbage is picked up by a livery-wearing chaffeur driving a Rolls-Royce. The real damage is done long before the bubbles burst. Ordinary people like me, my friends, and most my age or younger, are denied not only home ownership but the ability to rent a decent apartment. The new apartment sector is people like me renting Craig’s-list rooms from boomers with houses, with no real chance of getting roots or a foundation in life. No worries, we’ll be replaced by endless numbers of foreigners who are used to living in multi-generational and/or multi-family homes. American culture – what’s left of it – will become a regionalized minority in one generation. Then it’ll finally topple as we finally get a socialist in power who either turns the tide like FDR or pushes us into authoritarian decline like Chavez or Kirchner. The end of an era will come for all one of these years, it has already come for many who are permanently left behind in our increasingly monopolistic society. there are too many of you here filthing up the place with you rules and regulation’s. trying to make us Europe or California and pushing the prices of our houses into the stratosphere. let alone the fact that none of you are house trained or know what a rubbish bin is for. 1. Can’t walk the dog on the beach during certain hours/days. Many places totally prohibit dogs. 2. No drinking on beaches. 3. No smoking on many beaches. 4. No fires or BBQ’s on beaches. 5. No glass containers on many beaches. Pretty soon they’ll outlaw swimming at beaches. PS: They don’t know how to drive and speak funny English too…………. I have more of an issue with the ones that cant/wont speak English and have no intention of learning to or, doing so. All those writing and policing those ridiculous regulations, are paid for, by the TAX Payer. THAT IS WHY your taxes in Au are so F)(*&ng high. When the Fed or the ECB start seriously talking about reducing their balance sheets… then they are truly drinking their own cool-aid and that will be the cue imo. The Fed wants bubbles. When things get bad, you have to lie. Fed Kashkari is playing the time-honored Stupid Defense: something goes wrong, but the persons having the responsibility for doing something about it are Too Stupid to see it, and therefore are Not Responsible, and certainly not culpable. Reagan made it fashionable. He was really good at the Stupid Defense because he really was an idiot and was able to avoid responsibility for all manner of illegallities. Teflon, because nothing would stick. Since Reagan, the technique has gained wide popularity with crooked politicians, because it works. And yet, the Stupid Defense is also an admission of incompetence. You would think that lacking the ability to do a job would disqualify the person from getting the job or keeping the job, which is why you wouldn’t normally pick a high school dropout to be your brain surgeon. But you would be mistaken, when it comes to certain politicians and financiers, because it is precisely their stated disqualification – stated after the fact, of course – that is actually the crucial qualification for the job. Which is why admitted incompetents in these jobs won’t resign, and won’t be asked to resign. It is a fact that those who are prepared to lie, cheat, and steal have an enormous advantage over their honest competitors. The trick is to avoid prison long enough to gain enough power to avoid ever going to prison. And this is why the world is run by crooks, constrained only by the opinion of other crooks. I would have said the same thing differently, but I’m glad to see you have a clear view of how the top of the top of the financial world works today. What’s disappointing is how people reflexively assume the best when they see behavior and end results like this, over and over. It’s like people thinking that Enron would change if Ken Lay or Jeff Skilling only knew what the others saw. They are not incompetent — they are competent crooks. Ok, we can see, even measure the bubble(s). We also have a good idea of where the gas is coming from to inflate those bubbles. I think the key issue is what causes the bubble to burst, or fortuitously deflate (vague optimism on my part)? Are the same factors which popped the housing bubble in 2008 still around to do it again? Maybe what I am trying to discern is the structure of the next big short? Investment banks (Lehman Brothers, etc…) were leveraged up to the gills. They were also creating mortgage backed securities made up of liar loans and other poor quality mortgages. These were then fraudulently marked AAA by the rating agencies. When they had various loan payments coming due and didn’t have enough short-term cash they would trade (repo) some of the MBSs on their books for cash. Eventually, the banks taking the MBSs started seeing a lot of defaults and realized these were not AAA securities so they refused to trade cash against them. Suddenly the investment banks couldn’t make their own payments and the whole system froze up as no one trusted any other bank to make good on their loan payments. I’d hope that Dodd-Frank wouldn’t allow this particular scam to happen again. But I don’t if that is true. And I don’t know what other scams are out there. 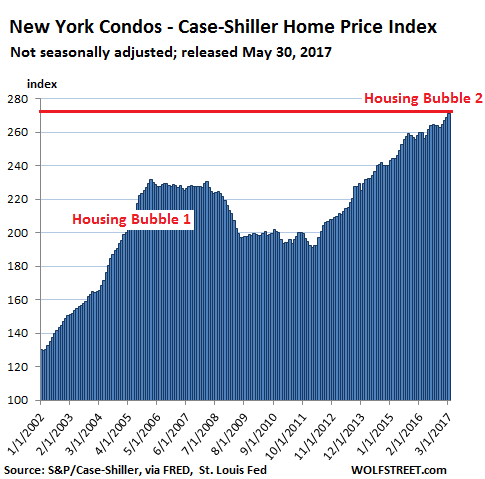 Is it really accurate to compare the two USA housing bublbes as the first one occurred prior to the passing of Dodd-Frank. As a result today’s under-writing standards are preventing the crazyness of ‘liar’ loans and the over-extension of mortgage credit. However the current very low interest rates, which were absent earlier, could be what’s behind the current bubble. As long as new owners are obtaining fixed rate mortgages then they’ll be insulated if rates should rise. That is until they try to sell but at least their mortgage payments will be stable. At ~4% mortgage interest rates, in this bubble , there’s a good chance most borrowers can make the payments….at least until they’re unemployed. Underwriting has been pretty strict in the last 5 years as well. Most of these loans have been sold to the gov as well. In contrast, back in 2005 to 2007, the underwriting was amazingly easy and the borrowers really had no chance of making the payments. That’s clearly not the case given the fact the median mortgage payment today is extraordinarily higher than the median of 2005-2007. Secondly a lower rate increases the risk of default. After the last bust the smaller regional banks were shut / telescoped into the TBTF so they ve consolidated their power -we now have an oligarchic neo-feudal banking system ruling the country -it is both unconstitutional (‘the US Treasury Shall create and control the nation s money’) and against Anti Trust legislation …All this could be fixed but the public doesn t even know it, the press (which has been focused on alleged crimes by a political outsider it s masters don t trust, apparently to distract from the true and proven parallel crimes committed by it s own candidate of choice (who accidentally lost)), isn t about to inform them. And the politicians are paid servants of said cartel…so it goes……. I read that William Dudley is puzzled by the lack of home equity loans to drive the consumption that the Fed expects. The only conclusion I can draw is that bubbles are policy tools. The debt serfs are acting gun shy. I suppose it’s a surprise that the plundered have yet to forget the nasty lessons of 2008-9. Research from the New York Fed suggests that if home-equity-related borrowing were to regain healthier levels — dating to the early 2000s, before the housing bubble — the economy could accelerate by three-quarters of a percentage point a year. Got that? So the excessive borrowing that led directly to the crisis in 2008 was “healthier”. I am absolutely astounded that such a belief exists at all. The Fed couldn’t possibly be that dense that they would risk another GFC for the sake of 3/4% growth per year? Or is the Fed that deluded – that convinced of its own omnipotence – that it believes it now has the tools to prevent another GFC from happening? If that’s what the Fed-heads believe, I am absolutely terrified. One other beneficiary of bubble blowing is your local municipality, happily collecting more tax from valuation increases. … with the consequence being your local municipality overspending and over expanding with all that new found tax revenue thinking it’ll last forever until the Piper Demands his due .. lowering the valuations and the tax income leaving said municipality in a load of debt and unfinished projects . Local municipalities have been happily overspending for well over a decade, and they never stopped. Of course this doesn’t mean they spent money on useful stuff: most municipalities in my area haven’t resurfaced any roads since 2005 and a couple haven’t since 2001 (! ), and sewer maintenance is a very occasional occurence but they are extra generous towards sports associations, for example by building swimming pools which end up being financial black holes. Having worked for a municipality in my youth all I can say is I am not surprised in the very least by the financial antics of US, Spanish and Chinese ones. Yep, and that is going to get cut way down when housing prices start tanking again big time. Wouldn’t it be wonderful if somebody hacked Kashkari’s emails and exposed his two-faced nonsense. It’s pathetic to watch a grown man hide behind obvious lies like that. Bubbles are just inflation, i.e. too much money chasing too few fixed assets. This always causes prices to go up, and is perfectly predictable, and is always a result of the concentration of too much liquidity (wealth) at the top (and the bubble could be predicted in detail if the actual amount of that liquidity was be known). The wealthy have to park their excess money someplace. In 1920s it was the U.S. stock market, the 1970s it was the oil sheiks buying 3rd world government bonds, 1990s in internet startups, and the 2000s real estate, oil, raw materials and derivatives…but it’s always something and it always goes bust once the excess money runs out. This time is no different. I’m certain the Fed has the same charts you have and understand what a bubble looks like. I think Kashkari and his ilk just lie. At least I’d hate to think they are that stupid. I’m also certain that you understand the concept that rising asset prices begets increased credit, which begets increasing asset prices. If you look at the history of rising and falling asset prices in the USA over the centuries, I don’t think you’ll find that interest rates always have a lot to do with asset prices. Banks create credit and money. We had booms and busts long before the Fed was created. So the question becomes, what should be done? Should the Fed target a specific asset price appreciation? Then target interest rates and/or deposit reserve requirements to meet that target? Is that something we want the government doing? Or possibly we should target it from a legal perspective. Make it against the law for someone to buy home that is more than 3 times their take home pay and require a 20% down payment. Couple that with maximum rent/square foot requirements and you would certainly put a roof on price appreciation. But again, that is government regulation and I’m certain the more libertarian minded among us would be deeply opposed to more government regulation. In fact, I think the Federal Reserve is doing exactly what it is chartered to do. It is providing liquidity when it is needed and supporting asset prices which support bank balance sheets. So should the Fed be chartered to do something different? The Fed could have allowed market interest rates. Sure, it may have caused some discomfort and led to political consequences but their financail repression leads to bizarre inequality. At the level of the Fed, there is no such thing as “market interest rates”. The Fed is the lender of last resort. When the market seized in 2008, there was no interest rate. People would not lend because they knew they wouldn’t get paid back. Same thing happened in the Great Depression. So the Fed steps in and targets a rate (the federal funds rate) and repos sketchy assets at par to make sure everyone has cash as needed to make their payments. The banks can then regain confidence and lend at whatever rate they want. Which I guess is the market rate. But I don’t think the Fed has anything to do with market interest rates. Everyone lends at whatever rate they want. Nobody is forcing banks to lend at a rate lower than they want. The Fed sure thinks they can affect market interest rates and that’s what QE was intended to do if you forgot. That’s why the Fed even now has a near five trillion dollar balance sheet. 2009 is a long time ago. Nice summary of the housing bubble (which has spread beyond US). Next, maybe highlight the bond bubble (which unlike the stock market casino should not be a gamble). I have always thought his name was made up, it makes me think of someone kneeling at the altar of cash and carry. Just a random musing from the peanut gallery. If US real estate is in that much trouble, just imaging the kind of trouble that Canadian and Australian real estate are in. The bubble in those countries are probably 3 times bigger; when they pop, it will be like the largest hydrogen bomb ever build blowing up :). If these economists are having so much trouble identifying patterns, they should probably hire one of the deep learning networks from Google. Every day, there is some breaking news of AI being used to identify budding cancers, detect traffic, and what have you. May be these PhD economists can use the help of their more competent PhD peers from other fields? If that works, may be can build a machine to run the economic policy and fire everybody at Fed. I wonder how much of the bubble has to do with real demand for housing stock? What % increase in prices has to do with increased demand for housing and what % has to do with the increased flow of funds in the economy from whatever source? US population has grown from around 280 million in 2000 to around 325 million in 2017. The number of housing units in the USA in 2000 was about 120 million. In 2016 the number was around 135 million. So was the increase in 15 million housing units during that period of time capable of handling the increase in population of 45 million people? For example, Chicago and Illinois are experiencing an outflow of population to other areas. Is Chicago and the State of Illinois have a bubble as well? If the Fed were in control, housing prices here in the bay area wouldn’t have fallen 36%. The Fed is out of control. IL increased their property taxes, even in small towns. Housing is “cheap” in IL because their taxes are YUUUUGE—you’ve been warned. What do they have to show for these huge taxes? Nothing. Exodus! 17,290,000 empty homes in USA right now. Only down from 18,600,000 2 years ago. That’s a lot of empty houses. A lot has changed since then… You can see them using fribulators on this economy. People are stretched and property taxes only increasing. It’s not just a American issue. Worldwide it’s pandemic as many countries have same problem. Income adjusted pricing might be even more obvious given the stagnation of middle-class incomes, or the data might be skewed by the relatively small percentage of high-income buyers in these major metros. If driven by high-income buyers, threats to those buyers can crash prices for the jumbo mortgages and custom homes. I might look for big deviations between median and average home prices. I also wanted to see the bubble relative to the long-term price trend as a bubble significantly below the long-term price trend seems less likely to burst than one far above the fitted line. Regardless, really interesting article. I recall that 2006-08 wasn’t that hard to perceive as a bubble at the time. The President’s concerns about Fannie Mae and Freddie Mac were dismissed by Congressional cheerleaders and nothing was done to tap the brakes. Guess what, the President was right. The wild lending mortgage lending policies echoed the buy stock on low margin policies pre-Great Depression. Government never confessed its role in the Great Recession. So a repeat is nearly certain. A lot of thought has gone into those charts, and they certainly show that housing prices have surged. But to know if the rising prices are caused by a bubble, I think we need to separate the properties out into two categories: those properties that were bought for all cash and the ones properties that were bought with debt. The proportion of cash purchases to mortgaged purchases probably varies quite a bit with location, too. In the last crash, a lot of the NINJA properties were bought up by hedge funds for all cash. They could make more money buying up houses and renting them out than by speculating in real estate. What if this time around, the rise in housing prices is being driven by hedge funds competing with each other to buy them? That would be something different from what we saw last time. The other thing that’s different this time is that rents are rising, not falling. The last time there was a run-up in house prices, rents were falling because the people who were buying the properties were just holding onto them until they could sell them at a profit, and renting them out to offset their costs. This time it looks like there are lot of corporate landlords in the business who seem to have more long-term goals. Rents are falling in my area. Quite a few other cities too. I fail to see how hedge funds using other people’s money is any different than borrowed money. I fail to see how hedge funds using other people’s money is any different than borrowed money. The answer is in your comment. Borrowed money (debt) can be repudiated or called in. Without debt, money can still be lost, but it’s not being lost by a creditor or a debtor. That, to me, would make this situation different from last time. Somebody else (private individuals? pension funds?) is taking the hit, not the banks. 17 million houses sitting empty, falling rents, 67 million people on some kind of government benefits, and you want to tell us this time is different? The only thing different is that we are 12 trillion more in deb than back then. – Greenspan told in 2005 the French finance minister that t’he US has lost control over the budget. He was well aware of hwat was going on in the US. And he then decided to retire. So, why shouldn’t Mr. Khaskari be able to see a bubble. – The 3-month T-bill rate jumped to 0.95% yesterday. Now I have change my mind. I now think the FED will hike rates in june. This rise in 3 month T-bill rate could be an early warning sign that US rates (across the board) could have turned a corner and could be moving higher from now on. But we’ll just have to wait and see. Playing the devil’s advocate here: this time may be different than Housing Bubble #1. This time, it is foreign money and investor money (buying RE for AirBnBing) who are inflating the prices. So this bubble may have a stronger financial backbone than the previous one. I agree wholeheartedly that the bubble is easy to spot on price alone, but the indication of when it will pop is likely due to consumer debt. Here’s an article I wrote that touches on how default rates on student loan and car debt may be the leading indicators of stress that will eventually roll to housing defaults. Another factor is rental rates, especially for single family homes, and I will likely write on that soon as well since I didn’t address in this article. I think the main difference, like others have stated, is that 2007-8 had a housing bubble with subprime, house flippers, and people purchasing homes they could never afford. The current housing bubble is investor driven, and it will likely be popped by government policy such as the Vancouver tax or higher property taxes. Until then, it can continue going up as long as central banks provide cheap money to hedge funds to continue buying them up. Central banks have a way of lengthening cycles by transferring more assets to the rich from the rest then could otherwise be possible. Our only roadmap is Japan post 1989 … the big difference however is that the Japanese are interested in preserving their culture whereas the US wants cheaper labor as fast as possible even if they have to replace their entire population. Housing bubble, Student loan bubble, Auto bubble, Healthcare bubble, $19 trillion debt bubble… these bubbles have enabled the 1% to accumulate vast quantities of wealth, the biggest scam in the history of mankind.. while the fools at the bottom continue to enable this by becomes slaves to debt taking monumental auto loans, home loans, student loans, credit card loans etc. No matter how many times these cycles end in tears people just keep indulging themselves in this debt addiction with extreme arrogance by dismissing any consequence.